There’s no denying that we all want to learn the tricks of the trade for gaining new followers on Instagram. 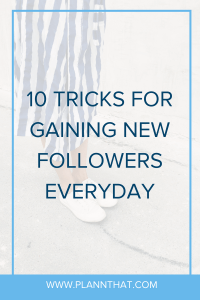 But what about gaining new followers on Instagram… every single day? Is that even possible? Well, in our experience, it totally is possible! At Plann, we’ve watched our Instagram follower count steadily increase every single day, and we are proud to see our users doing the same. There are a few different tricks that are well worth giving a try so you can see which ones you like the most – we can’t wait to share these tricks with you today! Enough yammering… let’s get into this blog post. If you have a specific theme to your Instagram account you can use this to your advantage to make gaining new followers on Instagram even easier! The trick? Tagging ‘feature accounts’ in your Instagram posts. As we explain in one of our other blog posts, a feature account is an Instagram user who re-shares content (with credit) that follows a specific theme. For example, you can find solo female travel accounts, watercolour art accounts and even specific dog-breed feature accounts. Want to make your puppy Instagram-famous? You can gain them a bunch of new followers by tagging feature accounts in your posts. For more info on feature accounts, take a peek at this other blog! On Instagram there are a few different types of hashtags with community hashtags being the most powerful type to use if you want to start gaining new followers every single day. The trick? Making sure that you choose a community hashtag that suits your content style. Do you share a lot of bright pastel-coloured posts? Try using #candyminimal. If you are like me and you really love the colour pink, add in #ihavethisthingwithpink to your hashtag list and see how you go. By following along and using a community hashtag (or three!) that suit your Instagram grid style you are going to attract new followers to your account who appreciate your aesthetic. If they are drawn to your content because they have similar tastes, they are way more likely to hang around and be a long-term follower. PSSST -> Did you know that the creator of the #ihavethisthingwithpink is a user of our multi-award-winning app, Plann? We think that is pretty freak’n cool! If you have a brick-and-mortar store, or you go to a bunch of networking events, don’t forget about the power you have to turn those in-person interactions into an opportunity for gaining new followers! Now, we’re definitely not saying that the first words out of your mouth when you meet someone at an event should be “HEY! Follow me on Instagram!!”. 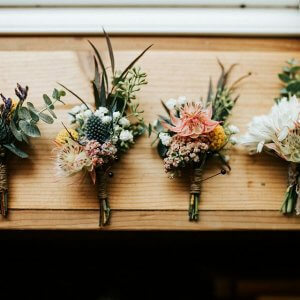 Instead, take a peek at some of our in-person marketing strategies that you can use to successfully promote your Instagram account. One fantastic way to start gaining new followers on Instagram everyday, seemingly on auto-pilot, is to invest in some imagery with a fellow brand owner who has a complementary product and a similar target market. Now, why on earth would you do that? Well, let’s say that your business sells handmade kids clothing and you meet someone who sells handmade kids toys. You could get flatlays and product photos done at the same time, with the same photographer, with both of your products in the shot as they ‘make sense’ to be together. When you go to share the photos from your shoot on social media you can tag each other in your content and ‘share’ your Instagram followers. If you aren’t selling the same thing, but have the same target market, why not give it a go? 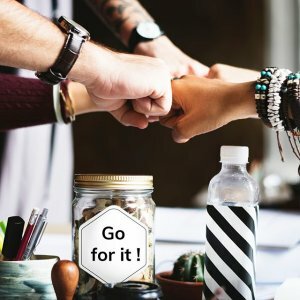 Small businesses need to support each other – collaboration is everything! Another fantastic trick for gaining new followers on Instagram every day is to encourage your followers or your customers to share photos and videos of their own using your branded hashtag for the opportunity to have their content shared on your Instagram account. This is particularly useful if you already have a large following as it will be a wee bit easier to get your audience involved, and the word of your branded hashtag will spread faster. If you need some more tips on how to find Instagram hashtags in the first place, here are some of our best insights. If you join in a conversation in a thoughtful way, you’re going to get eyes on your account. Seek out conversations on Instagram and leave long, well-written comments and if you happen to get a lot of support in the form of comment likes and replies to your comment, you will find that you will start to gain new followers. By committing to this ‘trick’ you are definitely going to see some uptake in your follower numbers on the ‘gram. But this little trick of increasing your posting frequency on Instagram will absolutely help you to start gaining new followers on Instagram. Especially if you post something new, with some new hashtags, every single day. Test this out on your account (and try with different posting times!) to see what works best for you based on your Instagram analytics. If you are wondering how you can gain more followers take a look at your previously high-performing content on Instagram to see what you did right in the past. Re-create those posts (whether it’s the caption, the imagery, or both!) and you are sure to start gaining new followers left and right. A fantastic way to keep your followers coming back for more (and encourage them to share your account with their friends) is to share entertaining content on Instagram Stories. To stay on track you can use an app like Plann to schedule your Instagram Stories in advance so that you never run out of things to post! If you’d like your followers to spread the word of your Instagram account for you by tagging their friends in your content, you need to create content that is worth sharing. One of the easiest ways to do this? Be raw, be real, and share the story of your brand, your products, your processes, your journey… really hone your storytelling skills and write captions that are meaningful and interesting. Captions that tell an interesting story are the key to help you start gaining new followers on Instagram every day. Phew! That is a lot of tricks of the trade we’ve shared… we hope you’ve enjoyed having a read. Let us know in the comments below if you decide to try out any of these!